Eight riot police officers have been injured in attempt to rein in a two-day prison riot over what inmates claim to be the harsh conditions of Russian prisons. Conflicting reports suggest protesters outside the facility were also beaten. On Saturday, which was deemed as a visiting day inside Penal Colony No. 6 in Kopeisk, in the Chelyabinsk region, hundreds of prisoners walked out, demanding relaxed conditions and the immediate release of some inmates from solitary confinement. Relatives awaiting visitation rights outside the prison joined in the protest as well. The detainees made placards that read “We have a thousand on hunger strike” and “Help Us,” and hung them from the top of the prison’s roof. Investigators have been called in to examine the prisoners' demands. 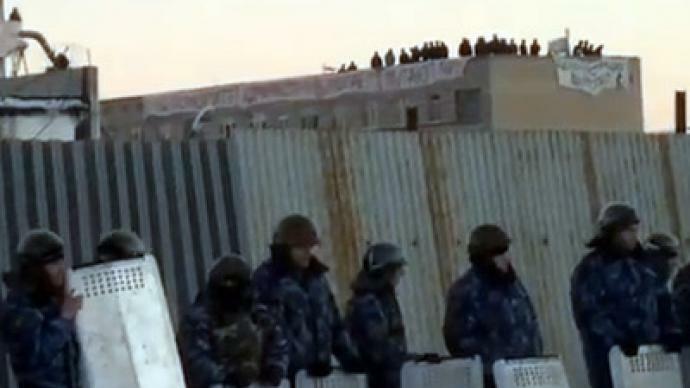 Following a brief investigation, special riot police units were summoned to the prison to restore order, while the city of Kopeisk was locked down. “During an operation to restore order in the prison, eight Chelyabinsk Police OMON [riot police] officers received injuries,” police officials said. Later on Saturday, relatives that were denied the right to see inmates sided with the prisoners, and were also dispersed by the police. According to law enforcement, the younger crowd appeared to be drunk and started a disturbance. The police detained around 39 of those involved. ­But people outside the detention center – even simple passersby unrelated to the riot – claimed they had been attacked and injured by the police. “Saturday was supposed to be a visitation day. People started gathering in the morning – some have come from far away – for the long visitation hours. They were all stopped at a door without any explanations. It then became clear that something was going on inside,” activist Valeriya Prihodkina told Lenta.ru. “Suddenly OMON, special riot police appeared, and other services, including fire trucks. That is when the relatives started panicking,” she added. “The police attacked us with sticks, without any distinction,” she said. Oksana Trufanova, a human rights campaigner and coordinator of Gulagu.net, told reporters that she had been hit on the head by police officers without provocation. A young man was injured as police detained people who gathered outside Penitentiary 6 in Kopeisk, Chelyabinsk region. About 250 convicts stage a protest (a still from RIA Novosti video. Maximum available quality). Furthermore, Sevastianov explained that the rioting in the colony – along with the demonstration at the prison gates – was arranged in advance. “What is of concern is that the external environment was prepared for protest. There were not that many relatives who have gathered near the colony. They were mostly people from 27 to 40 years old, throwing snowballs at riot police. 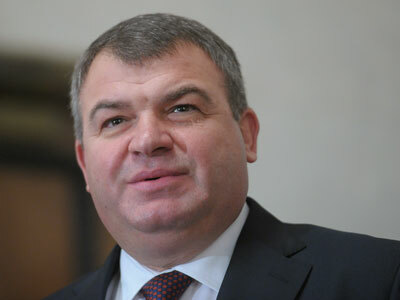 I saw it myself,” Sevastianov told Lenta.ru. Convicts' relatives outside Penitentiary 6 in Kopeisk, Chelyabinsk region. About 250 convicts stage a protest (a still from RIA Novosti video. Maximum possible quality). Meanwhile, the convicts are still continuing their protest, prison press officer Ivan Mishanin said. “FSIN [Russia's penal system administration] staff from Moscow have arrived at the prison to sort out the situation,” RIA reports. Russia's Investigative Committee is looking into the events surrounding the protest, including the inmates' refusal to obey prison staff's orders. In May 2008, twelve new inmates were brutally beaten by 18 wardens inside Colony No. 1 in Kopeisk; four died from their injuries. During the investigation into the incident, prison officials told the inquiry that the inmates had attacked them. In May 2011, eight were sentenced to various jail terms while the others received suspended sentences. 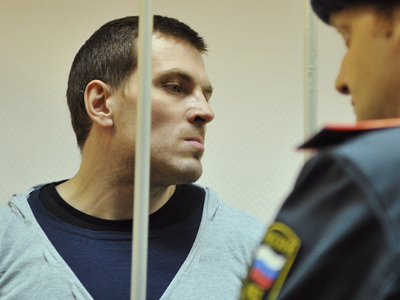 Russia has numerous problems with its prison system, ranging from overcrowding to unsanitary conditions. But it is often judged by the tragic consequences of its most famous scandals, like the case of lawyer Sergei Magnitsky, who died in police custody from a number of medical conditions after he was prevented from receiving treatment. A banner "People, Help!" unfolded on the roof of a building in Penitentiary 6 in Kopeisk, Chelyabinsk region (a still from RIA Novosti video. Maximum available quality).